Hi all just found out Apple is requiring all new apps and existing app updates will be required to use SDK 12.1 starting in March 2019. Apple wants all apps to take advantage of iPhone Xs Max or new 12.9" iPad Pro. 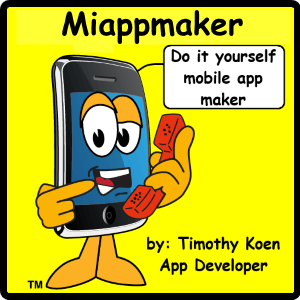 If you have an app with Miappmaker we will update the app for you. We will be contacting you to let you know of these updates. Looking to build a new app. MaM is the place. We use the latest technology to build iOS and Android apps. Don't get left behind. All new iPhones are coming with the latest version of iOS SDK. Apple is encouraging all iPhone users to update to their latest operating system. Do you like fast loading web pages? We do! We recently added 'lazy loading' images to the Website Tools Store. Here's whats up. Everybody hates to wait on a page to load on the Internet. But when we shop we want to see nice big pictures. The problem is you can't have both, until now. Turns out we only need to load images into a webpage IF it is to be displayed on the screen. So why not wait until the user gets there to load up the images? That is exactly what the new 'lazy loading' script does. With 'lazy loading' the webpage starts up lickity split (really fast) and can be viewed right away. While unseen images are delayed until that portion of the page is displayed. This is important on really big pages with lots of pictures. Like the 'Website Tools Store' on this website. You can see the effect on this page. SucculentID mobile app is being updated. Lots of new plant profiless, categories and information have been added to the app. Image quality is being upgraded as well. Check out the video guide built into the app. New plant profile pages include Aloe, Kalanchoe and Senicio species. Looking for infomation about a mobile image gallery for your app? This mobile app builder has several image page types. This tutorial teaches you how to use the "Mosaic" mobile image gallery page type. Easily create a mobile image gallery with this slick online tool inside Miappmaker mobile app builder. The image gallery (Mosaic) page shows thumbnails of your larger images in a grid. Each grid space is clickable. Clicking a thumbnail reveals a new fullscreen image with title and caption. Edit and configure the gallery quickly without using any code or programming, all that is done for you. Get ready, get set, go, in a couple of days. We've been updating the SucculentId Mobile App all month. Updates are done, SDKs are compiled and the app has been submitted to the App Stores for review. On or about 1Mar2019 or there about we will re-launch this app. SID features upgraded imagery, new and expanded plant profiles and two new categories. We also bumped the base design layout from 4 inch to 5.5 inch screen size. The author graciously agreed to supply new larger, more resolute, prettier pictures for the app. Our biggest concern for this upgrade was overdoing bandwidth. To keep file size down we compressed most of the images. Thereby we were able to upgrade quality and offer a more positive user experience. Todays lesson is this; compressing images saves file space and decreases load time. We use TinyPng.com to compress images. This free service is awesome. Up till 20 pictures per day or 5mb file size. After that the premium service is unlimited images per day and up to 20mb files, for only $25/yr. Why did we do this? Was there something wrong with the last version? We did this because technology improves over time. To keep up, an app needs to be rebuilt and re-uploaded to the App Stores about once a year. New rules and regulations need to be adhered to as well.The original ver 1 release was built for older, smaller smartphones. This ver 2.0 features cleaner more modern framwork used by newer mobile devices. Other reasons for this app update include a lot more content. By reducing file size we were able to include more content. We included 9 new pant profiles and 2 new categories of plant types. Does your business need an Amazon Business Account? Do you make purchases for a business? Need a better way to find and keep track of suppliers? An Amazon Business account may be right for you. Features include "Business Prime, Business Price Savings, Fast Free Delivery Options, Multi-user Accounts, Pay The Way You Want and Find What You Need" tools and services. Use the purchasing tracking dashboard to organize your company's expenditures. Get analytics to see individual spends, group activity or the whole company. Use the Competitive Pricing Tools to get the best deals. Organize and analyze your purchasing with the most advanced shipping company in the world.